This week, the Hebrews finally leave Egypt. 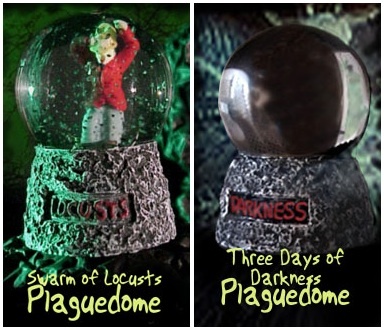 First, three last plagues: locusts, darkness, and the slaying of the first born. Now Pharaoh is actually bargaining: Only the men can go, but leave the children and livestock; OK, the children can go too, but leave the livestock; and finally, all right, go, serve the Lord and bless me too! And we read about the first Passover, the blood on the doorposts, the paschal lamb, and the rules for all the Passovers to come, both rituals and what to teach the children of the future generations. We learn about eating matzah, and sanctifying the first born, and tefillin. When I wrote about this portion last year, I focused on the plague of darkness as a mass depression, darkness of the soul (https://igplotzk.wordpress.com/2012/01/27/bo-exodus-101-1316-2/ ). In 2010, I commented on birth imagery as suggested by R. Michael Hattin, that the bloody on the door is a symbol of birth – the home as womb, the door as a birth portal (http://vbm-torah.org/archive/intparsha/shemot/15-62bo.rtf ). This year, I’m too chipper to write about darkness, too sanguine for a discourse on blood (pun intended). So let’s take a closer look at what is probably the least exciting but, long term, most significant part of the portion: the laws expounded right after the mass exodus (12:43-13:16). Rituals?! Laws?! Generally dull and honored more in the breach than in the observance (except for eating matzah). This section, the first of many we will read with a lot of legal details. But what really matters is that the Hebrews are being asked to perform, to act, to do. The focus on the detailed actions will facilitate their divorce from the idolatrous ways of Egypt (Shemot Rabbah, 16, 2); in particular, the animal sacrifices involve sacrificing that which is sacred to Egypt (Rambam). They, we, are forced to stop and think when performing these acts, which will increase our awareness of the workings of the Lord (Ramban). Religious training in Judaism is not meant to flow from reason to action; on the contrary, character is cultivated by repeated actions (Rambam) (sources are all as cited in Nehama Leibowitz, New Studies in Shemot). As we will read in a few weeks, the order is “Na’aseh v’nishma” we will (first) do and (then) listen. Most of our readers are not God, but those who like to play God will love the Swarm of Locusts snow dome. Give it a shake and watch the holy anger rain down again and again on its plastic victim. Because they happen not to be divine beings themselves, the good folks at Vermont-based Products of the Apocalypse, Inc., are still working on making nine of the 10 Biblical plagues commercially available to the masses, but the hand-crafted Locusts dome is currently in stock and Three Days of Darkness is purportedly coming soon. but Products of the Apocalypse, Inc. seems to have vanished. People are like stained – glass windows. They sparkle and shine when the sun is out, but when the darkness sets in, their true beauty is revealed only if there is a light from within. Everything has its wonders, even darkness and silence, and I learn, whatever state I may be in, therein to be content. with all the commotion it was hard for G-d to hear what Moses was saying. The other day I was in my rabbi’s office for what she and I like to call my 10,000-mile tune-up. And there she was on a bookshelf in a plexi-glass frame—a super hero ready to wrap and unwrap at a moment’s notice to redeem the world—my old friend Tefillin Barbie. Tefillin Barbie is modest and learned and devout. She wears a long denim skirt. Her sleeves are below her elbow. She wears a head covering and is draped in a tallit—a prayer shawl. And, of course, the most notable thing about her is that she wears tefillin. Prominently, proudly and naturally. I know all the feminist arguments against Barbie, but I can’t help myself, I’ve always loved Barbie. She came into my life when I was six-years-old and bedridden for three months. I spent hours dressing Barbie in ball gowns, tennis skirts and my favorite—a bridal gown. Through it all it never fazed me that Barbie was blonde and tall and I was not. She measured an impossible 36-18-38, but I attributed that to the fact that she was a doll. Barbie has had over eighty careers ranging from a rock star to a presidential candidate who focused on educational excellence and animal rights. She has served in every branch of the military and was a medic in Operation Desert Storm. In addition to being a devout Jew, Barbie is also black and Hispanic. Forty-five nationalities claim her as their own. She has been present at diplomatic summits and the dismantling of the Berlin Wall. And now she is a woman who reads Torah. I’m not surprised that Tefillin Barbie’s inventor is a soferet—a woman scribe who is trained and certified to write holy texts by hand. According to the Jewish Women’s Archive Jen Taylor Friedman is one of six soferot (plural of soferet) in the world. She has a workshop in her native Southampton, England handwriting an entire Torah for a congregation in St. Louis. So where does this newest incarnation of Barbie fit in with our own mothers and sisters and foremothers? For one thing she’s an all-American girl who is at ease with every aspect of Jewish ritual. And here’s a wish inspired by Barbie’s sales numbers. Every time that a Jewish girl comes of age, may she be comfortable in her own body and wrapping her own tefillin.